In case you missed it, this morning I went over the mathematics necessary to take the four factors of hitting to the next level. Now, it’s time to put it to good use. As Eric pointed out in the comments section, the way that the math is done, we could figure out how much a change in one of the factors changes a player’s wOBA by taking the derivative of the new formula for wOBA derived from the four factors equations. However, that’s a lot of work, so instead, as he suggests, I’m going to do this analysis numerically using a little program called Microsoft Excel. Let’s test run this method on the simplest of targets: the league average player. In this case, we’ll use the league average player from 2009 MLB. In 2009, the league average BB% was 8.9%, the league average K% (K/PA) was 17.9%, the league average POWH (XB/H) was .595, and the league average BABIP was .299. 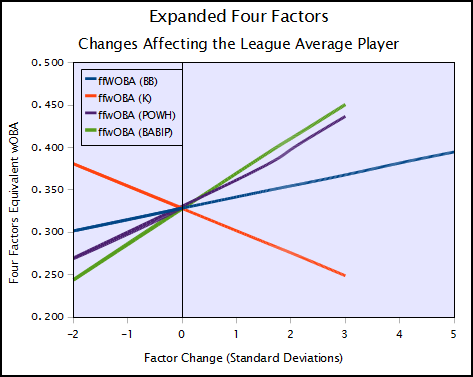 The following chart shows how changes in each variable changes the player’s Four Factors Equivalent wOBA (ffwOBA). In order to more easily visualize these on the same scale, I looked how changing each statistic by one standard deviation impacts ffwOBA. In this case, one standard deviation for BB% is 3.7%, for K% it’s 7.3%, for POWH it’s .257, and for BABIP it’s .049 points. The slope of these lines tells us how sensitive wOBA is, at least as predicted by the four factors, to changes in each stat. BABIP is the steepest, as changing BABIP by one standard deviation changes wOBA by 41 points. Next is POWH, which although it isn’t perfectly linear, it’s close enough that we can treat it as such. Changing POWH by one standard deviation changes wOBA by 33 points. One standard deviation change in K rate changes wOBA by 26 points. A player’s wOBA is by far least sensitive to BB%, as a one standard deviation change in BB rate only changes wOBA by 13 points. My explanation for the small changes in wOBA brought upon by BB rate changes is that increasing BBs, at least in this model, reduce all favorable outcomes (all hits) as well as reducing outs. The reduction in outs is enough to mean that an increase in BB% is a good thing. However, decreasing K% only means decreasing outs, increasing POWH means increasing 2B, 3B, and HR at the expense of 1B, which is a high net increase, and increasing BABIP means increasing all hits at the expense of outs, which is clearly the best of all results. Through the rest of the week, I’ll be taking a look at some interesting players, hopefully examining how this method performs at the extremes. We hoped you liked reading Expanded Four Factors: The Average Player by Jack Moore! Jack – This is great stuff, but my suspicion is that a major reason you won’t see as big a resultant change in wOBA by moving BB% or K% is that you scaled to standard deviation. Looking quickly at your data set, I couldn’t see what cutoff for PA you used, but you didn’t limit the pool to qualified players–these effects will skew the standard deviations and averages based on player seasons with small numbers of PAs (probably a wash on the bias directionally) and overvaluing seasons by players who got lower playing time based on their skill levels (which almost certainly biases these rates toward worse abilities). I didn’t run any involved normalcy tests on the stats, but I did look at both ends of the distribution for players that ended up qualified as a quick check. Two standard deviations comfortably grabs all the lowest K-rates, but there are four >2-sigma players on the high side. The same is true for the lowest BB-rates too, but there are six >2-sigma players on the high side of BB% in 2009. This not-normal distribution is to be expected for these statistics in that you’d expect a longer tail on the high side because the mean is closer to the minimum than the maximum, but it’s also giving you a pretty meaningless standard deviation. BABIP, using the same check as above, encapsulated all the lowest BABIPs and all but one of the highest (David Wright’s ’09 was pretty lucky, huh? ), which you’d expect because BABIP is way more about luck than skill, especially compared with K% and BB%. As such, you’d expect it to be more Gaussian. (That said, I’d still expect a long-tail toward high-BABIP because it strikes me that there are more players that do well on balls in play based on their skill set than those that do really poorly based on a skill set.) The result, I suspect, is that, due to scaling, the amount of impact you’re showing on wOBA is in large part a reflection of how normally distributed any given stat is. Although it’s possible that the implication is that it’s better to be lucky than good. It might be instructive to look at the value of making small changes to K% versus BB% on the same percentage scale. I’d be interested to see the results. But great job–I’m enjoying the four-factor series immensely.